This is the moment you’ve all been waiting for! Meet our new buddies for the rest of our bicycle touring adventure: the Santos Travelmaster 2.9 with Pinion and Gates Belt Drive! No, it was definately not time to send the Travel Lites to the bicycle graveyard, they could easily keep going, but these new Pinion babies need a ride on tougher ground. And we have the honor to be one of the first (if not the first) world cyclists to show them around the globe. Dutch based bicycle manufacturer Santos Bikes gave us a Santos Travel Lite for a first ever durability test. 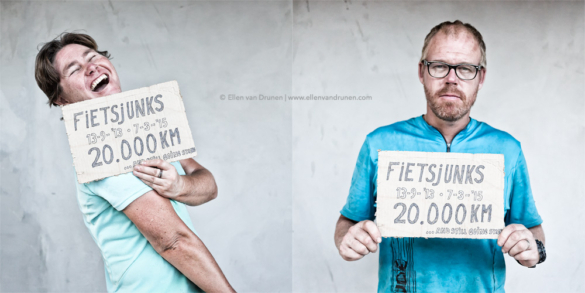 With more than 20.000 kilometers I guess we can now give you some insight on our experiences with this 29-er. The Santos Travel Lite has been our loyal friend since the beginning of our bicycle touring adventure; more than 20.000 kilometers ago. We’ve abused ‘Wilson’ and ‘Storm’ badly! But, the Santos bicycles didn’t even blink! They are strong, stiff and comfortable and MAINTENANCE FREE. Watch this video to see where the Travel Lites have been and what they had to endure.